Unless otherwise noted, evening performances begin at 8:00pm, and matinée performances, marked '(m)', begin at 2:00pm. '(m/e)' indicates both matinée and evening performances. To purchase tickets, please visit our Tickets page. Play dates: 2018 September 14, 15, 16 (m), 20, 21, 22, 23 (m), 27, 28, 29. 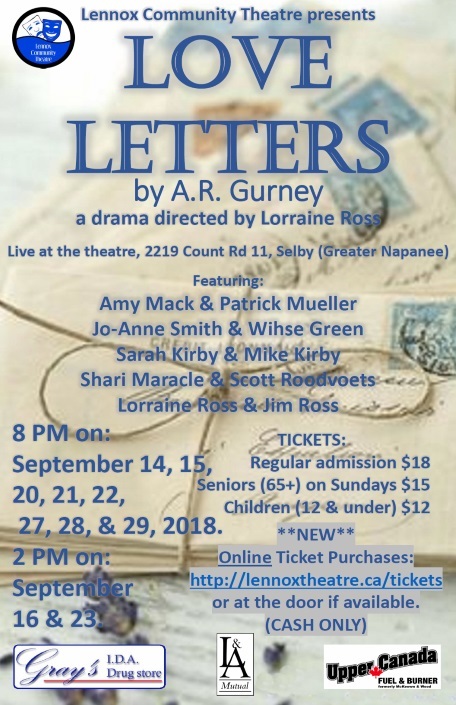 "A unique and imaginative theatre piece... comprised of letters exchanged over a lifetime between two people who grew up together, went their separate ways, but continued to share confidences. As the actors read the letters aloud, what is created is an evocative, touching, frequently funny but always telling pair of character studies in which what is implied is as revealing and meaningful as what is actually written down." (From dramatists.com.) By arrangement with Dramatists Play Service. Play dates: 2018 November 23, 24, 25 (m), 29, 30; December 1, 2 (m), 6, 7, 8. "Meet the Nowaks of Buffalo, NY. 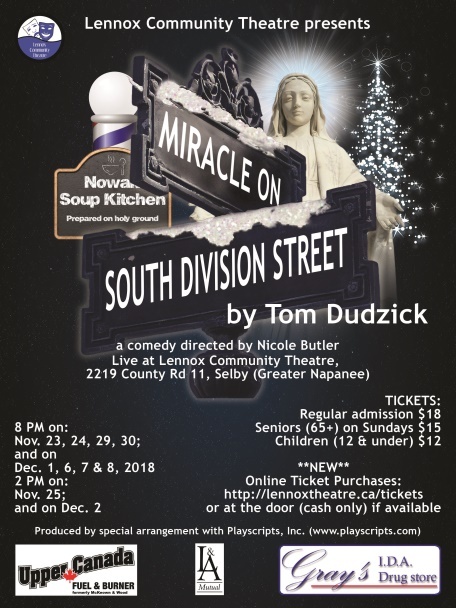 Clara and her three grown kids have always known they were special, ever since the miraculous night in 1942 when the Blessed Mother appeared to Grandpa in his barbershop! Since then, the neighborhood has looked upon the Nowaks' 20-foot commemorative shrine as a beacon of hope and faith amidst the urban rubble. And now, at Christmas, daughter Ruth unveils her plan to write and star in a one-woman show about the family miracle so the 'whole world will know!' However, as her plans for theatrical immortality unfold, the entire family's faith is shaken to the very core when a deathbed confession causes the family legend to unravel. The results are heartfelt and hilarious." (From playscripts.com.) By arrangement with Playscripts. Play dates: 2019 February 1, 2, 3 (m), 7, 8, 9, 10 (m), 14, 15, 16. "Herb, a Hollywood scriptwriter currently 'at liberty,' is surprised when his forgotten past reappears in the form of Libby, a teenage daughter who's trekked from Brooklyn with dreams of movie stardom. With Steffy, his sometime paramour, at his side, Herb decides to take another stab at fatherhood and hopefully this time, get it right." (From samuelfrench.com) By arrangement with Samuel French. 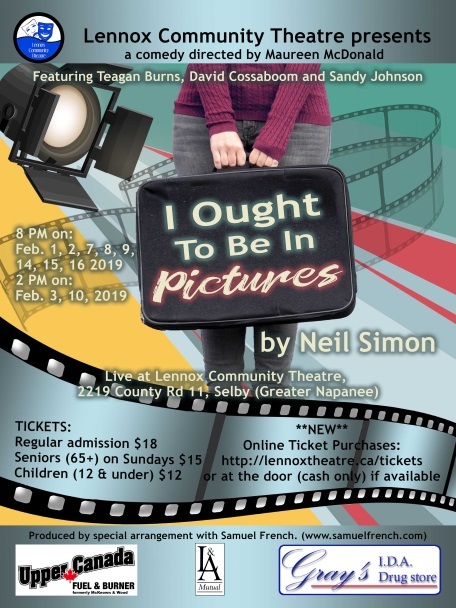 Play dates: 2019 March 29, 30, 31 (m); April 4, 5, 6, 7 (m), 11, 12, 13. It is 1932. Roy is an ex-miner and a shop owner in Pickle River, a small mining community in northern Ontario. Jane is an aspiring big city journalist who boards the wrong train on her way to a new job, and ends up, broke, in Pickle River. Roy acquires a license and some used equipment, and sets up a radio station, the town's first and only. Jane is persuaded to join in on the effort and appoints herself director of programming. The sudden appearance of a competing news and entertainment source annoys Percy, the owner of the local paper. Jane's campaign to line Pickle River's muddy streets with cement sidewalks upsets the town's delicate political and business balance. The station's playing of upstart jazz music has a vocal mother launch a petition to revoke its license. 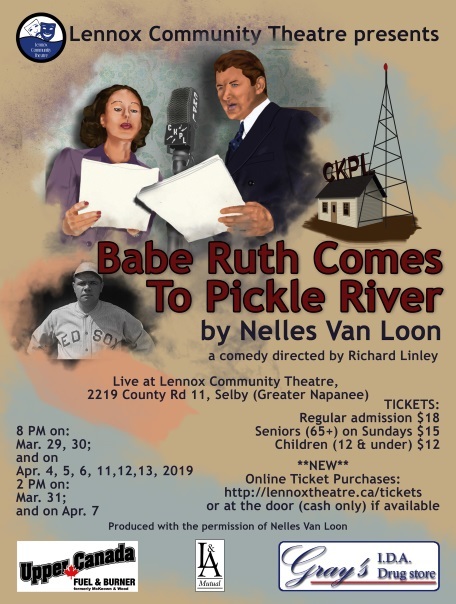 Against this resistance, Roy feels he can triumph if only he can find a way to broadcast a live World Series baseball game featuring the legendary Babe Ruth. By special arrangement with the playwright. 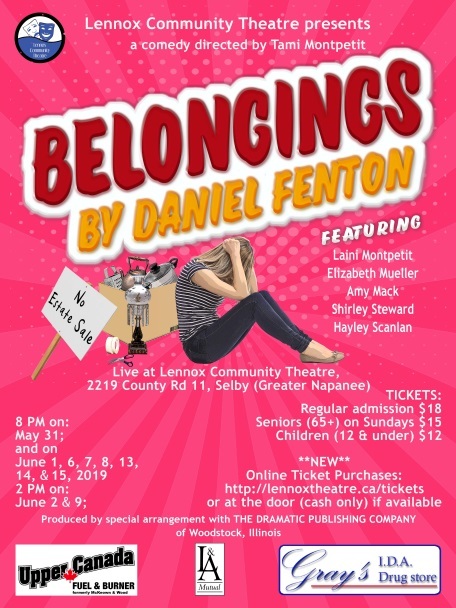 Play dates: 2019 May 31; June 1, 2 (m), 6, 7, 8, 9 (m), 13, 14, 15. "Three generations of women find themselves at a crossroads following the death of the family's matriarch. Reeling from the loss of her grandmother, 14-year-old Katy is determined to keep her grandmother's spirit alive and promises that her home and belongings will remain intact. The promise flies in the face of her family's plans for an estate sale and draws the battle lines between Katy and her mother, aunt and great-aunt. The family's failure to confront the issues of death and grief create a storm of pent-up emotion on estate sale day. Overnight, Katy and her sister Jimmie call an all-out war, reversing preparations for the sale and moving everything back into the house. Katy's battle hits its peak with a 'house-jacking' as Katy and Jimmie barricade themselves inside Grandma's house with threats to stay unless the sale is called off." (From dramaticpublishing.com) By arrangement with Dramatic Publishing.